Provide comfort for the family of Linwood Getchell with a meaningful gesture of sympathy. 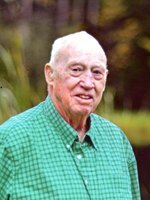 Levant and Lakeland, Florida - Linwood H. Getchell, 92, passed away unexpectedly on January 29, 2019 at his home in Lakeland. He was born June 14, 1926, in Levant, the son of Joseph and Hazel (Goodwin) Getchell. Linwood attended school in Levant and East Corinth. He served in the United States Army and was a WWII veteran. After the war, he worked with his father and his uncle Walter Goodwin, drilling wells around the State, eventually going out on his own until he was seventy five. While drilling a well in Calais, Linwood met his future wife, Ruth McPheters. They married and had almost 50 years together before she passed. They became snowbirds in the 80’s. Linwood was a 65 year member of the Kenduskeag Lodge #137 A.F. & A.M., was on the dartball team at the South Levant Baptist Church, aided in starting the Hungry Hallow 76rs Snowmobile club, loved to play cards never refusing a game, and read at least a couple of books a week. In addition to his parents and wife, Ruth, he was predeceased by eight siblings. Linwood is survived by his brother, Herbert Getchell and sister, Darlene Getchell; children, Connie Langley (husband Rodney), Walter Getchell (husband John LeBlanc), and Philip Getchell (partner Judy Biggar); grandchildren, Nichole Langley “his worst granddaughter” (husband Ray Fletcher), Ashley Getchell, and Gregory Getchell (wife Elizabeth); great grandchildren, Lindsay (fiancé Ethan Dysart), and Josh Nutter; special nieces, Hazel, Roselie, Becky, and many other nieces and nephews. We encourage you to share your most beloved memories of Linwood here, so that the family and other loved ones can always see it. You can upload cherished photographs, or share your favorite stories, and can even comment on those shared by others.